Congratulations to Leanne. 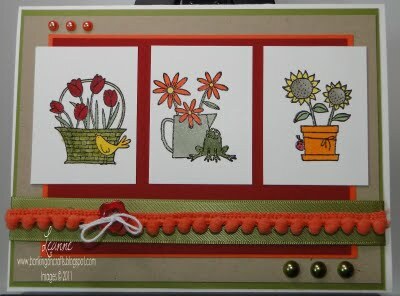 She is our Featured Artist for Sketch Challenge 223. You have to love the Tangerine Tango pom pom trim as well as her customized pearls. She colored the top to match the Tangerine Tango and the bottom to match Old Olive. Great Job highlighting your images with the layers in the background...Hope to see you soon! Thank you so much...I sure loved coloring these images...fun stuff! !